History is my kids favorite subject. They love stepping back in time to see how people used to live. 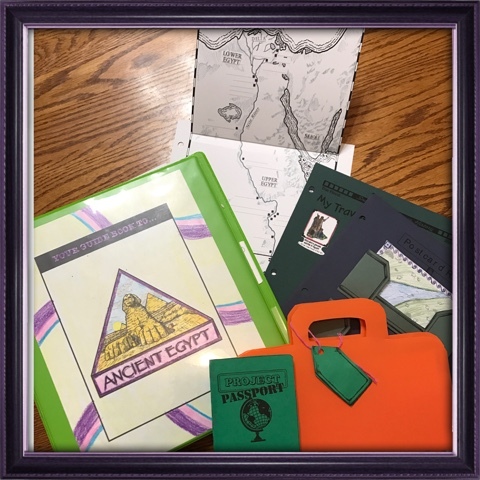 Alaina was thrilled to use HISTORY Through the Ages Project Passport World History Study: Ancient Egypt from Home School in the Woods. She has used The Middle Ages from Project Passport in the past and liked Ancient Egypt just as well. History Through the Ages Project Passports is a group of World History Studies that students will use the same passport to travel to Ancient Egypt, The Middle Ages, the Renaissance & Reformation, and their newest title Ancient Greece with Ancient Rome becoming available in 2018. It is recommended for children in 3-8th grade and covers History/Social Studies (Cultural Studies), Language, Geography, and the Arts. It is available on a CD or a download version. The Project Passports start with your preliminary travel plans that include an introduction to the program and travel tips to help get you started. There is also additional resources as well as a Travel Planner: Quick Stop Guide. The lessons are actually called Stops and the reading is the Guide Book Text. The Travel Itinerary includes the projects and directions and sometimes there is an audio tour for that Stop. Alaina has been traveling to Ancient Egypt this time and in the past she has been to The Middle Ages. Since this is her second Project Passport Study she used the same passport and suitcase she made the last time. There are 25 Stops or lessons in Ancient Egypt lasting 8-12 weeks, but you can spend as much or as little time on each stop as you would like. You could very easily go through one lesson a day or depending on the ages of your children and the resources you add it could last longer. There are timeline pages and figures to print as well as postcards, dining guides with recipes, games, souvenir craft cards used to create crafts to keep as a souvenir, and pockets to fit them all inside the lapbook. We received the download version of the program and it is very easy to use. After unzipping the files I had access to each file folder of the PDFs, MP3s, lapbook, and images. Or I had the option of viewing all the files in order in a web browser. From there I could click the link and open the pages that needed to be printed, read, or viewed. There are colored photos showing exactly how to put a lapbook together making this perfect for beginning lapbook users. The directions for printing each page indicates whether it needs to be printed double sided, on cardstock or colored paper. There are also photos to indicate exactly where each project should be placed within the lapbook. Alaina learned about every day life in Ancient Egypt including what they wore and ate, how they worked and played, their education, medicine, architecture, their government, and what they believed. She completed maps, made crafts, cooked recipes, and colored post cards from famous people. I sat with her each day we started a new Stop and printed the pages she needed then she would complete her reading and projects on her own. There were a few stops we completed in one day and there were other ones she wanted to spend a couple days on. She wants to read as many of the books listed in the resource section as she can. We already own several of them, but she hasn't read them all. She is currently into cooking, so she said her favorite part of this study is Dining Out Guide. 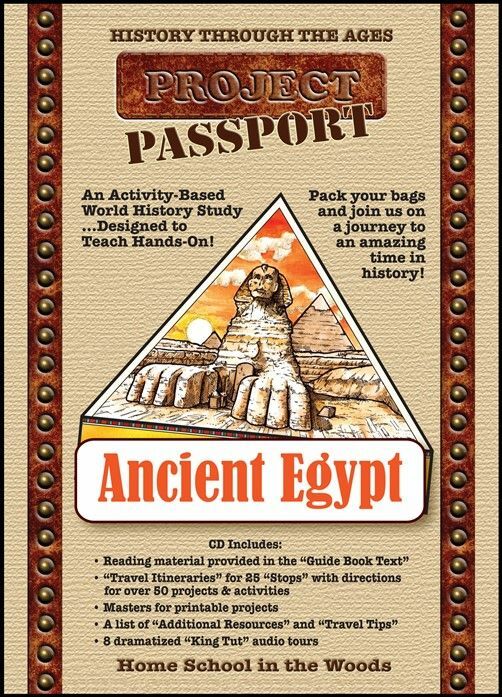 Besides the HISTORY Through the Ages Project Passport World History Studies we have used from Home School in the Woods we have also used HISTORY Through the Ages Hands-on History Lap-Pak: U.S. Elections and HISTORY Through the Ages Hands-On History Activity-Paks: Composers. We also own the HISTORY Through the Ages A Collection of Historical Timeline Figures Creation to 21st Century for several years and have used them often. Members of the Homeschool Review Crew received all four Project Passports available at this time. Be sure and read those reviews on the Crew Blog.